The Phoebe H. Stein Child Life Program complements medical treatment by focusing on the emotional and developmental needs of pediatric patients through medical play, procedural preparation and accompaniment, diversion and creative expression. For most children, a hospital is an intimidating place. In addition to the distress of illness and/or injury, unfamiliar faces and surroundings can leave children feeling anxious, confused and isolated. These emotions can overwhelm their natural ability to cope and heal. Child Life Specialists work in all areas of CHAM, including the inpatient units, outpatient practices and the Pediatric Emergency Room. 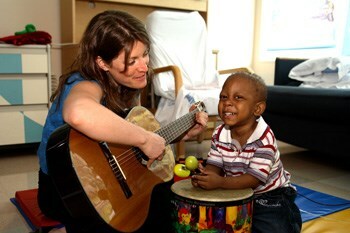 The Child Life Program also includes two music therapists and one art therapist who work therapeutically with children. Child life services play a key role in delivering quality pediatric care and can help you and your child deal with a hospital stay in a number of different and creative ways. In fact, the provision of child life services has become a quality benchmark of an integrated child health delivery system. Referrals to Child Life Services are made through interdisciplinary rounds with the medical team based on criteria developed by the Child Life team. These criteria include, but are not limited to, a new diagnosis, isolation, separation from family/friends, anxiety, and pain. Many children find it challenging to express their feelings verbally about the hospital experience and the effects of illness on their lives. Art therapists have advanced training in the use of art as a therapeutic tool along with psychotherapy. CHAM’s art therapist works closely with the Child Life Specialists and medical team to identify those children in need of art therapy, based on pre-established criteria. The art therapist uses a mobile cart of art supplies to visit patients at the bedside in all inpatient units, playroom groups, the Emergency Department, and in the outpatient clinics. The art therapist works with patients individually and in small groups, and works with the Child Life Specialists to help them incorporate art into their daily programming with children and families. CHAM’s music therapists use singing, playing instruments, song-writing, and listening to music to help children manage pain, reduce stress, enhance their immune system, improve their mood, and even decrease the length of their hospital stay. Sessions are held individually as well as with families and groups. 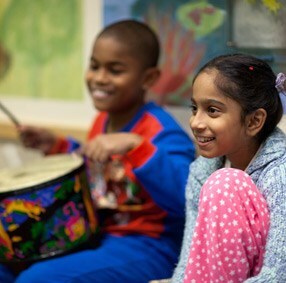 Using music therapy assessment techniques, the music therapists can provide the clinical team with valuable insights regarding a patient’s emotional well-being, physical health, social functioning, communication abilities, and cognitive skills. This information then can be integrated into a patient’s care plan to ensure that his or her needs are being addressed at a comprehensive level. The Phoebe H. Stein Child Life Program runs many ongoing programs and events sponsored by various charitable organizations. These programs bring the creative and performing arts, magic and puppet shows, and music to the bedside of children at CHAM.